DamienSullivan: This page (used to be) classified under Humour, but I think it's not just funny stuff; it would be interesting (and upsetting) if slavish mirroring always gave drawn games, or even boring losses, with interesting games only being because of an agreement to struggle. E.g. it's possible to have a rock-paper-scissors tournament, if the players are trying to find patterns in each other's guesses and exploit them, as opposed to using a stronger random play strategy. That mirroring can be soundly punished reassures me. I'd also say that it seems the non-superko strategies have a common idea: entangling a group with its mirror, and being the first to give atari. If the atari is mirrored then you capture; if the mirror breaks off to escape then at least you've broken it, and hopefully can get them on the run. Defeating a mirror in normal handicap go might be different: capture a handicap stone, build a second eye, then have the group surrounded. The mirror group needn't be in contact, but will die because there's a handicap stone where one of its eyes should be. Curtmack: I played this out when one of my friends played mane go, except he announced he was before hand, so there weren't any stones near the edges. When he connected at , I connected at . This is a roughly even position to play from. Of course, he could also screw this strategy over by deviating long before this works out. How to counter mirror go there? SAS: There seems to be a practical problem with the method shown above for countering the 6-stone handicap mane-go. If Black stops mimicking as soon as White plays on the first line, then White's position is pretty bad --- even allowing for the 6-stone difference in stength I think it may be difficult for White to win in the face of Black's huge moyo. Snoopdogg Althought that works, why would white play there in the first place?? 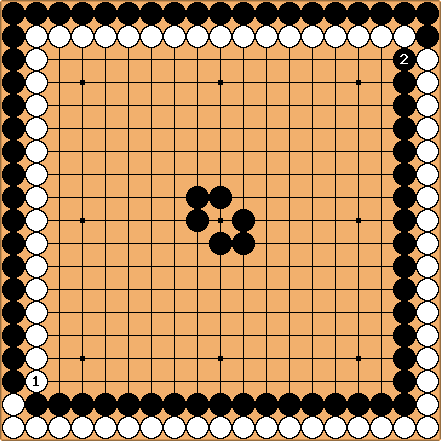 unkx80: This technique has existed for a really long time already, it is Hikaru no Go that has conveniently used it in its comic. 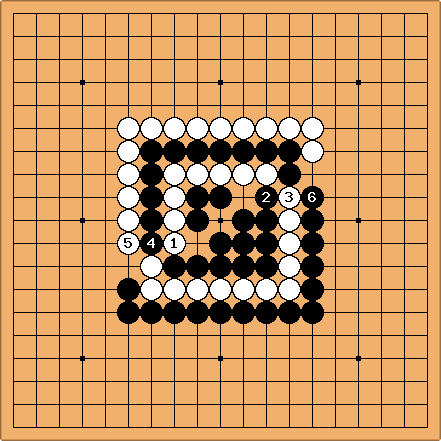 There are variants in the order of moves, though. 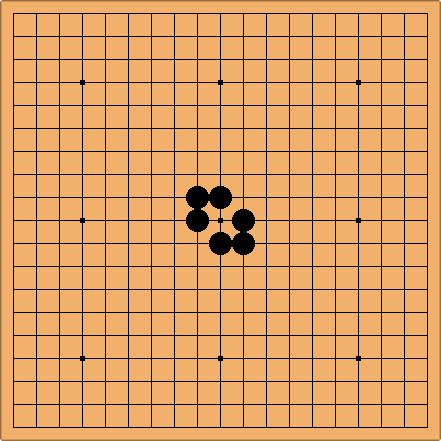 Dieter: That comment is somewhat outdated, because the superko strategy has been added. blubb: How so? I don't see why trying to set up two kos means that there's no better response. 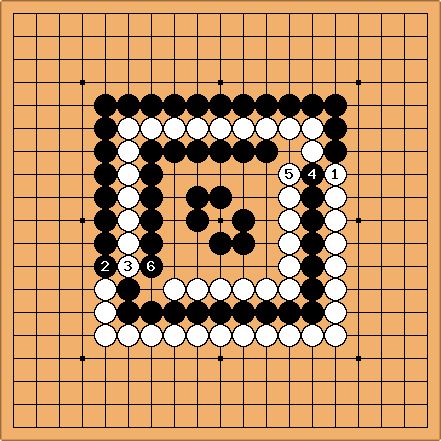 unlike in many games in practice, superko is presupposed. But, still, these situations are highly artificial. tapir: The focus should be on a strategy to counter mirror go without playing outright bad moves. If you do so and the opponent stops mirroring, you have broken symmetry but you are at a disadvantage. 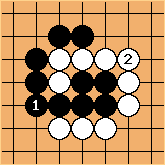 In fact you do not need to capture, with komi you can play just to make the tengen stone worth less than komi and the game is yours. But doing so without bad moves isn't so easy at all. Winning against a mirror go bot is one thing, but when someone applies some thought and is prepared to break symmetry at any time it might be in his favour, it isn't so trivial.